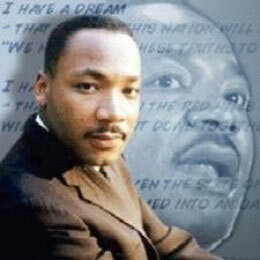 It’s Martin Luther King, Jr Day today in the US. It always falls on the 3rd Monday of January which is close to Dr. King’s birthday on January 15th. In some southern states the national holiday also ironically celebrates the birthday of the Confederate General Robert E. Lee as well (January 19th), but Martin Luther King, Jr Day is at least now recognised by name by all of the USA. Some also tie the holiday in with Civil or Human Rights Day, which are least compatible with Dr. King’s legacy. National holidays in the US (they’re known as Bank holidays over here in the UK and mostly observed as a paid holiday) do not have to be celebrated, although state and federal bodies generally are closed for business. Being so close to the winter holidays, not every employer gives its workers the day off to remember the man who ‘Had a Dream’, had ‘seen the Promised Land’, and ‘been to the Mountaintop’. This is sad, but in a time of economic challenge there’s not too much attraction in taking a day off if it means you don’t get paid, at a time of year when there’s not an awful lot to do anyway, like there is in the summer. The thought’s there at least and, with Dr. King and his Dream, there’s a good vibe about it, despite the struggles he had in the fight for racial equality and for jobs, and in the way he died for those principles. Dreams after all aren’t always happy and can end badly – but that speech, made in Washington on August 28th, 1963, still resonates down to us, all over the world as one of those moments when you know history is being made and which is why Toronto, Canada and Hiroshima in Japan also honour Dr. King on his special day. Dreams are important and everyone has them, even if they don’t talk about them. I’m talking about the waking kind, rather than the sort you do in bed. Dreams that make you happy, make you strive for more, give you hope, or a reason to go on, even though you’re in despair. They can shape us, make us become better people, or else lead us down false paths, and leave us frustrated and bitter at the fate dealt to us. Just as you should be careful what you wish for, you should also perhaps exercise some discipline over what you dream about, because dreams don’t always succeed. Yet without a dream – a good dream, life could become tasteless and dust in your hands, because all you’re left with is what you have and, if that isn’t very much, then what else will you ever have? Dr. King had his Dream that even he wasn’t sure could be attained, but he carried on and he did see the Promised Land from that Mountaintop, even if he was gunned down and never got there. The people who wanted his Dream carried on and, even now, it perhaps still hasn’t been fully realised, but it still goes on and it gets better by degree, because of Dr. King and his testimony to that Dream on that day when he didn’t know his own road was going to end on a motel balcony four years later. He strived for his Dream and he went on doing that until he couldn’t go on any more.